There is proof of mail tampering, blatant obstruction and judicial misconduct across multiple states. There has been decades of deprivations across multiple states, covering multiple industries - Music Industry, Book Publishing and Legal System! Deliberately deprived of all opportunities and rights! BOOK LINKS- Download Books on Amazon or Google Play! All Rights reserved. Thank you for your support! Abuse of Power, Corruption and Misconduct, Facilitates Modern-day Slavery! 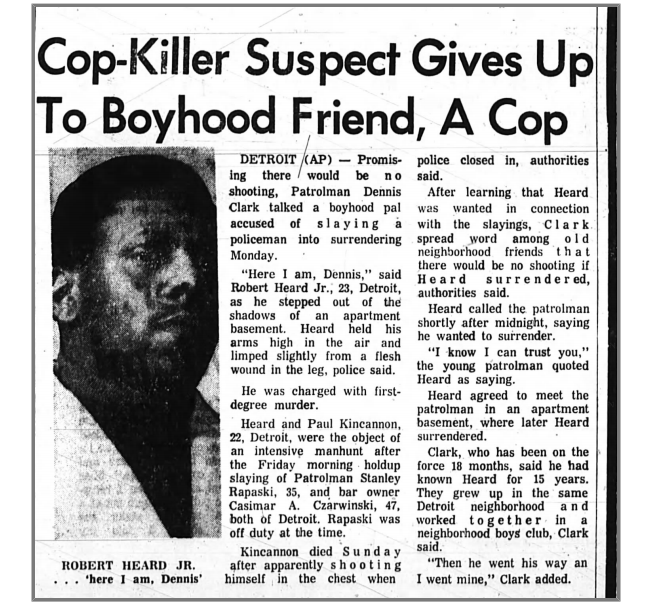 As the daughter of man convicted of allegedly killing a police officer, I have been subjected to years of unaddressed deprivations. I have never had any issues or history with mental illness or drug abuse. I have never been some hardened criminal, but my background is managed by those who I have accused of acting ‘under color of law.’ Due to inaction and willful deliberate indifference, this has made me easy prey for those who have been negatively impacted by this corrupt ‘network’ or ‘system’ operating with impunity. No one should be forced to live without any shield against corruption. I was told that I should kill myself but I refuse. The documentation speaks for itself. I am seeking legal assistance so that my rights as a citizen can be restored. I am requesting help to unseal my FBI File because it was not sealed until I asked for a copy. While ‘under color of law’ Officials modified CJIS/GCIC criminal background without a hearing or cause on a (FOA) First Offender sentencing (although subject was reporting as directed by court under the First Offender Act. 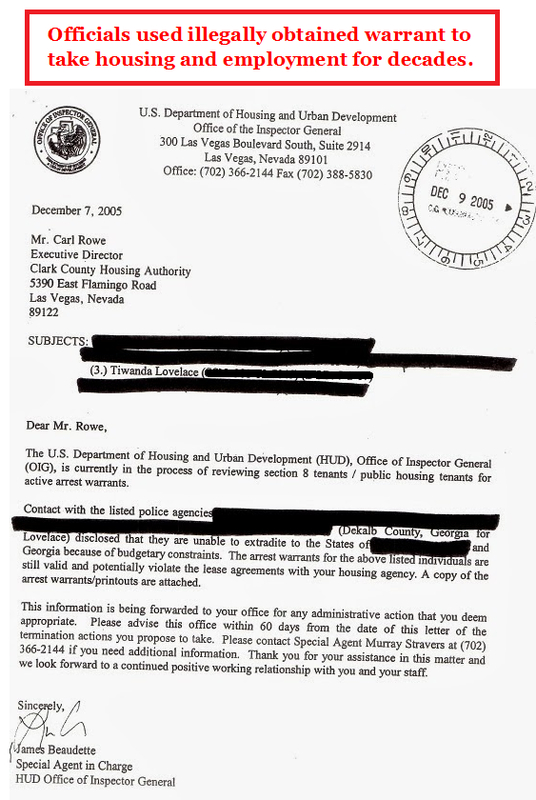 Officials used illegally obtained warrant to seize housing and repeated hindered employment. Plaintiff filed a second lawsuit against a police agency but was met with blatant obstruction and intimidation. 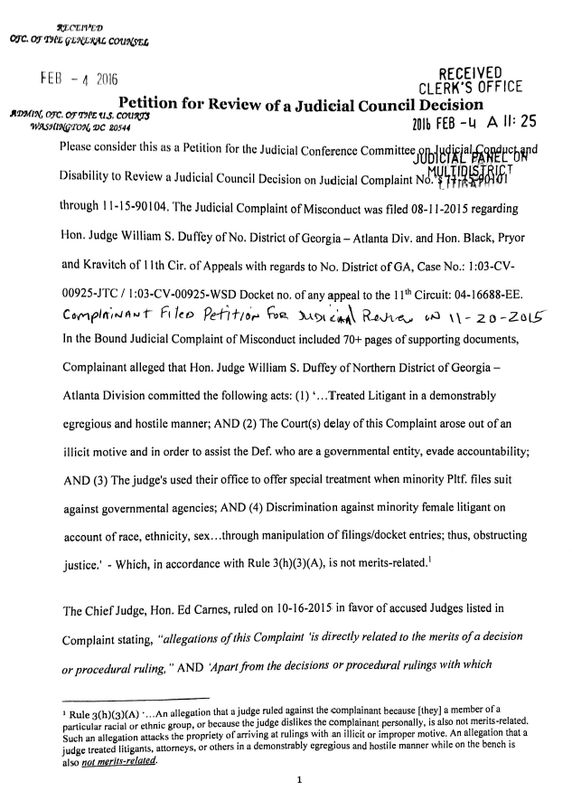 Plaintiff’s court filings were illegally modified, judges were switched without cause prior to summary judgment ruling which confirms blatant obstruction and deprivation of rights. Under the FOIA and due to privacy violations, plaintiff requested a copy of F.B.I. 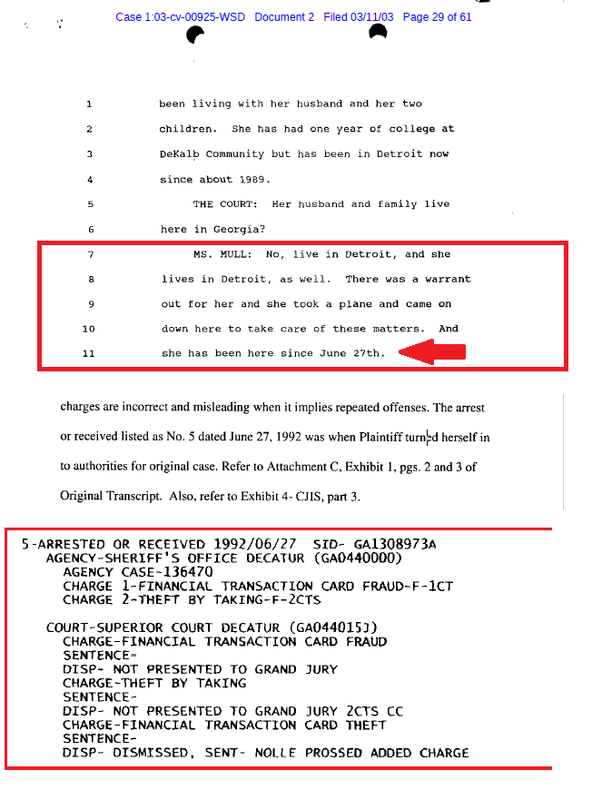 files on herself and others. There were 221 pages of 357 pages of the F.B.I. file that were questionably SEALED BY COURT ORDER, just prior to request for file. These videos are intended to provoke thought and inspire change in how bullying 'under color of law' by officials and those in power truly affects its victims. These videos also address its impact on future generations. These videos are intended to provoke thought and inspire change in how bullying 'under color of law' by officials and those in power truly affects its victims. This video also addresses its impact on future generations. Officers maliciously made multiple false and misleading entries on criminal background. 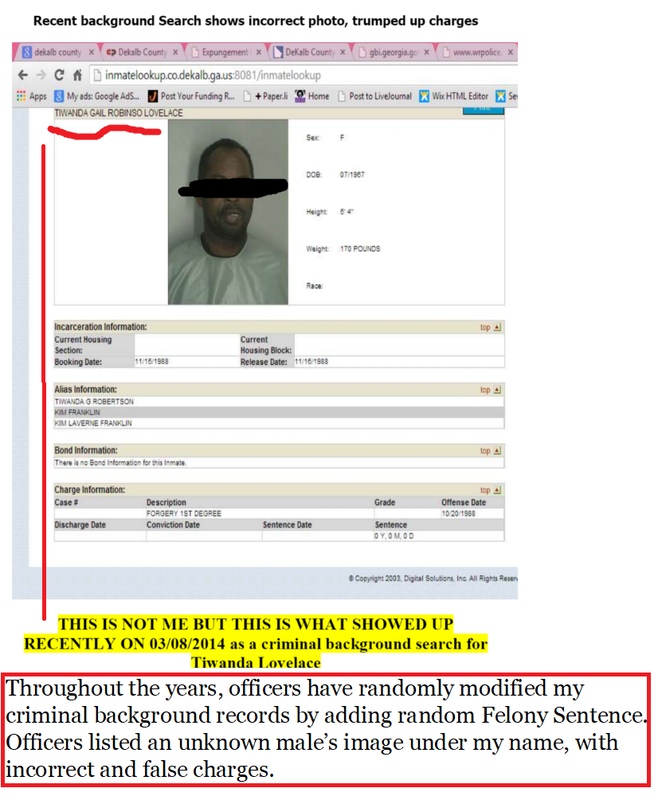 Officers made false random modifications and entries to my background for years. I flew back to surrender (after 4 years), instead of reporting - Surrender. 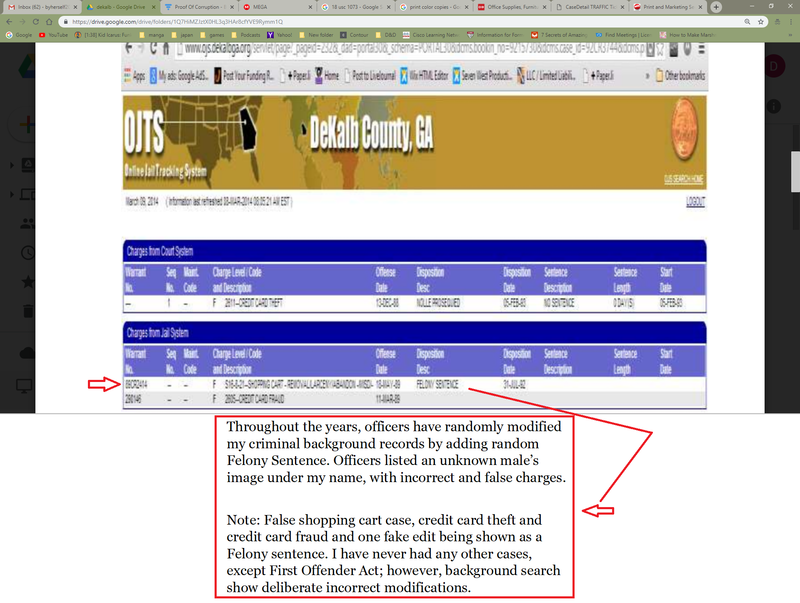 Magically two more false unrelated charges were entered. 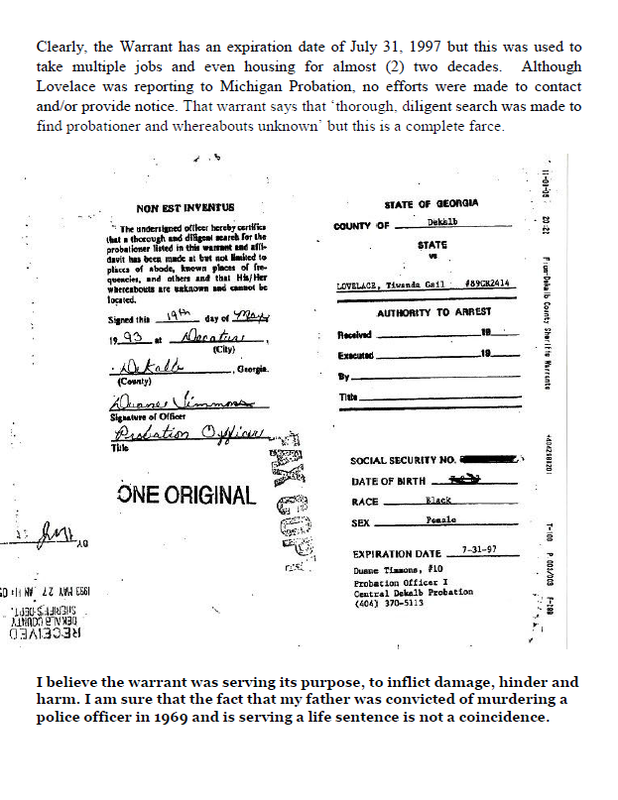 Warrant obtained ilegally without cause or notice of hearing was used to take housing. Proof can be found in videos available at my websites or by contacting me. (Videos are difficult for others to modify). Email: [email protected] or +1 (702) 860-0116 or +1 (702) 900-4087. Email: [email protected] or +1 (702) 860-0116 or +1 (702) 900-4087. Although the unethical practices are not limited to any single industry, even after providing solid evidence of unethical business practices, secured copyrights in response to copyright infringements and contracts, the standard response was to attempt to discredit, induce suicide and to intimidate. When you attempt to exercise your rights to seek justice through the courts, you face deliberate deprivation of rights, judicial misconduct and obstruction. The entire process facilitates betrayal, initiates competition among its writers/producers and battles for royalties. If you manage to survive, the aforementioned is followed by some subhuman offer consisting of less than slave wages, meant to minimize the damage and avoid true accountability. These titles are presented through this artist/writer’s eyes while experiencing multiple tragedies and events. Emotionally charged, this title clearly expresses the pain and anger of being betrayed, sacrificed and scorned. Inside, are the actual documentation and files used to demonstrate some of the tactics used to steal artist lives, deny rights and enslave the artist. This title is compiled using personal journals, public records, contracts, copyrights and other documentation which demonstrates how it is allowed to continue. When the smell of violence was fresh and 'street justice' was being used inflict further damage, the initial response from professionals (both, legal and official) was, "(We) can't help you..." These events cover thirty years of willful, deliberate civil and criminal violations used to cover up atrocities. Although I have a letter from DOC Central Probation confirming adjudication without guilt, upholding FOA First Offender Act completion. My CJIS/GCIC criminal background has not been corrected and updated. 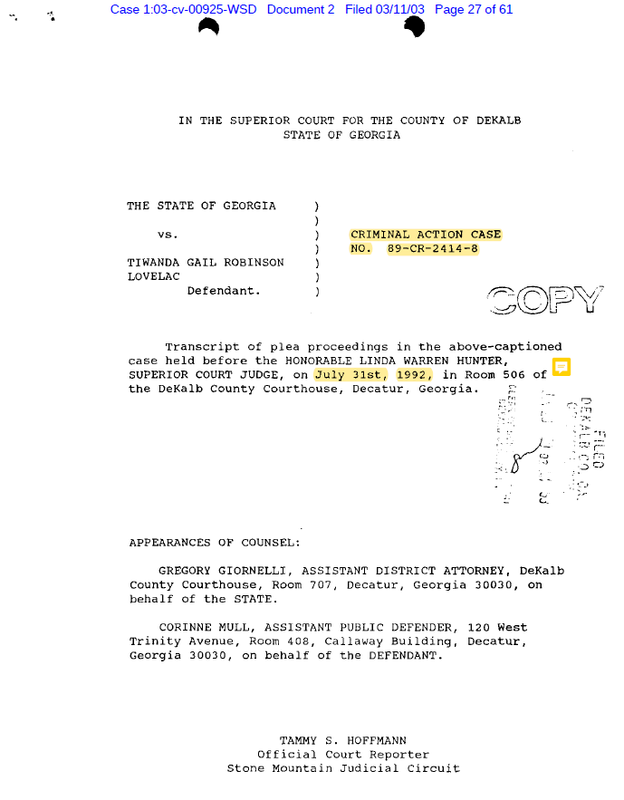 The Dekalb public defender’s offices provided assistance in receiving the First Offender Act in 1992. The Dekalb public defender’s offices helped quash the illegally obtained warrant and helped close the case without adjudication of guilt under the FOA-First Offender Act. I have a letter showing that this Case was closed without adjudication of guilt under First Offender Act O.C.G.A. a42-8-60 but officers have not corrected and updated GCIC and CJIS. This letter should have generated a GCIC/ CJIS update at least 3 of the 5 Arrest or Received and removal of conviction from original case no. Case: 136470 / 89CR2414. I have been attempting to have my illegally modified GCIC and CJIS updated and corrected. GCIC Entries 3-5 are from the same case number – 136470; however, they are entered as different charges and arrest. Although each of the entries were well before and included (same case number) under FOA and there has been no criminal history, my criminal background has not been corrected or updated. 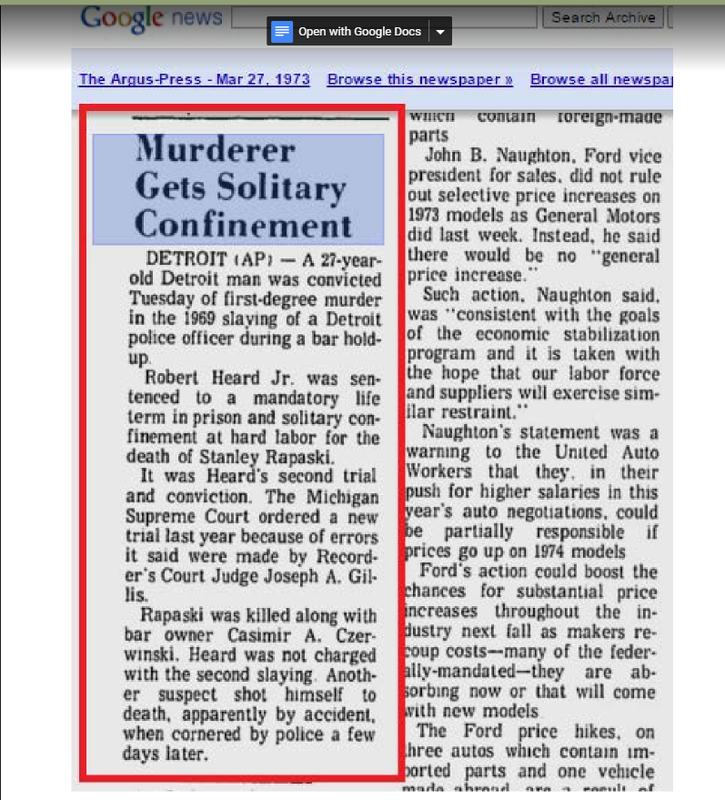 I failed to mention that I am the daughter of man convicted of allegedly killing a police officer has been subjected to years of unaddressed deprivations. I am not asking for your offices to take on my plight to fight officials. I am only requesting assistance in clearing my illegally modified criminal background. Basically, although I have received adjudication without guilt under the FOA, for over 20 years I have been deprived of employment opportunities, housing and the ability to travel. I am unable to maintain employment, so I have no income to cover cost for Request to Restrict Arrest Records or pay a lawyer. The officers presented a warrant stating that I had absconded when I was reporting as directed, without notice of hearing. 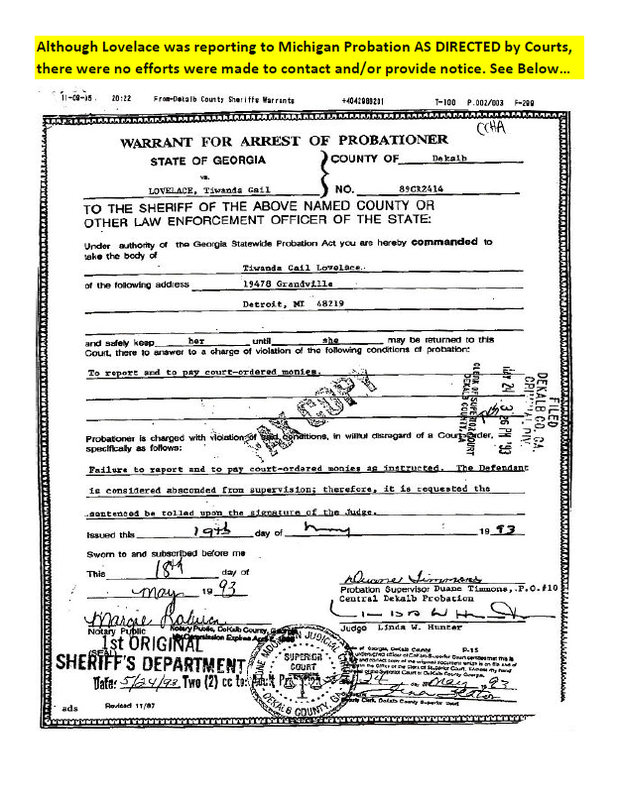 They used this illegally obtained warrant to modify my FOA sentence to conviction, without cause or notice. After decades, The Dekalb public defender’s offices helped get the illegally obtained warrant quashed. I have been deprived of all rights to seek justice and denied basic needs. Blatant proof of abuse of power and deprivation has never even been addressed; instead, they are dismissed. Due to the entities involved, when I seek assistance these entities use their positions, influence and power ‘under color of law’ to hinder. Files are available at: Dekalb Georgia or click the following link - https://drive.google.com/open?id=1vQ6apCx2d7gQjRRlG-_r_JZWv9LcI8JQ. G.C.I.C AND C.J.I.S. 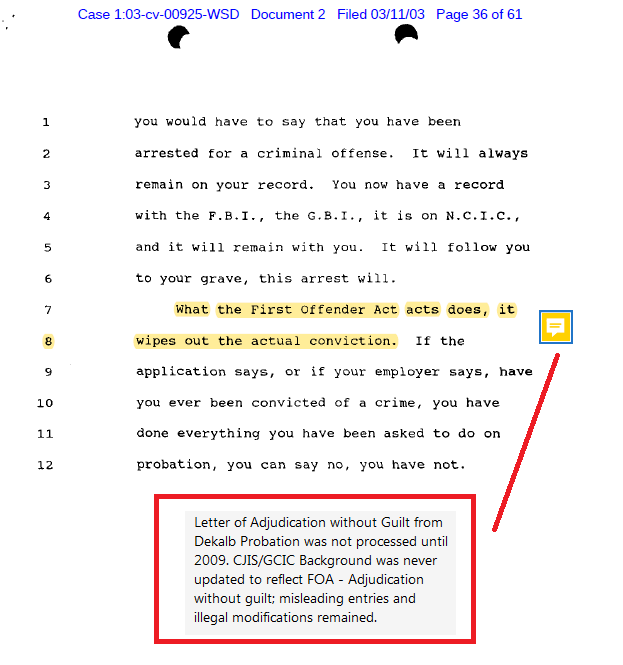 shows that Lovelace’s First Offender Act was changed to Conviction, although no sentence should be modified without prior notification to all parties and hearings on the matter. Refer to Inter-State Case Report from Michigan Probation Office. No contact was made, and no notice served. Would you be willing to assist in the removal of dismissed arrest and update of GCIC / CJIS? I have completed the application for assistance through Public Defenders office. P.S. This is additional information that summarizes situation and clarifies questionable inaction. I am not a lawyer. I am trying to be heard by someone who can properly address. According to O.C.G.A. 17-10—(f), ‘Any order modifying a sentence which is entered without notice and an opportunity for a hearing as provided shall be void.’ In Morrisey b. Brewer, 408 U.S. 471, 484 (1972) – ‘to the probationer, who is integrating himself (or herself) into a community, it is fundamentally unfair to be promised freedom for turning square corners with the State but to have the State retract that promise when nothing he or she has done legitimately warrants such an about face.’ Similarly, it is irrational for the State to conclude, in the absence of valid cause tracing to the probationer’s conduct, that warrants changing First Offender’s Act to Conviction. Thus, while the state can define the rules of punishment initially, choosing probation or imprisonment, the State cannot change the rules in the middle of the game. 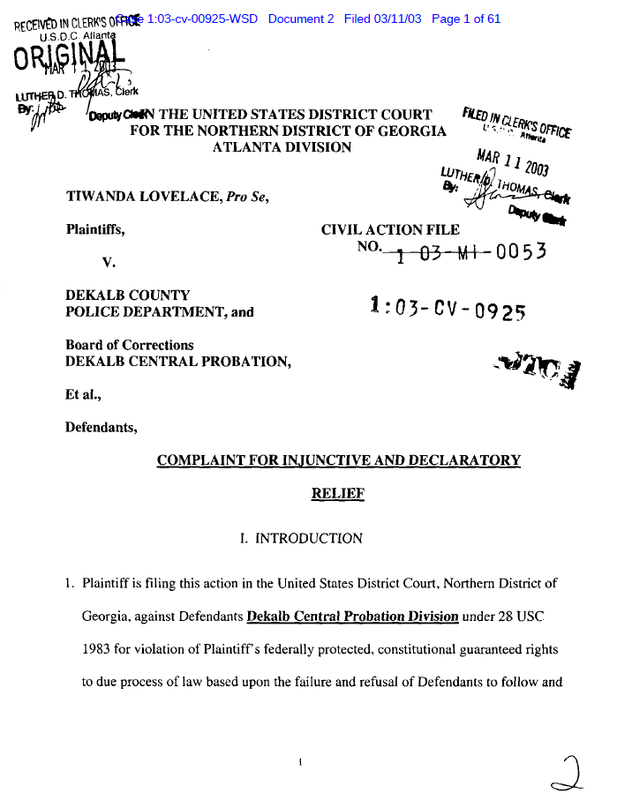 See Wood v. Georgia, 450 U.S. 261, 286-287 (1981) – A probation violation must therefore be such as to make it logical for the State to conclude that it’s initial decision to choose probation under the First Offender’s Act should now be abandoned. Refer to Attachment, ‘Plaintiff had no prior criminal record; that is, other than a dismissed domestic. G.C.I.C AND C.J.I.S., both receives and share information submitted and provided by local authorities, such as police and sheriffs. Department employees are trained and instructed on the validation process to ensure that only accurate, valid information is maintained; however, for the last (10) ten years, obviously questionable information has been entered and allowed to remain on Lovelace’s G.C.I.C AND C.J.I.S. reports. G.C.I.C AND C.J.I.S. 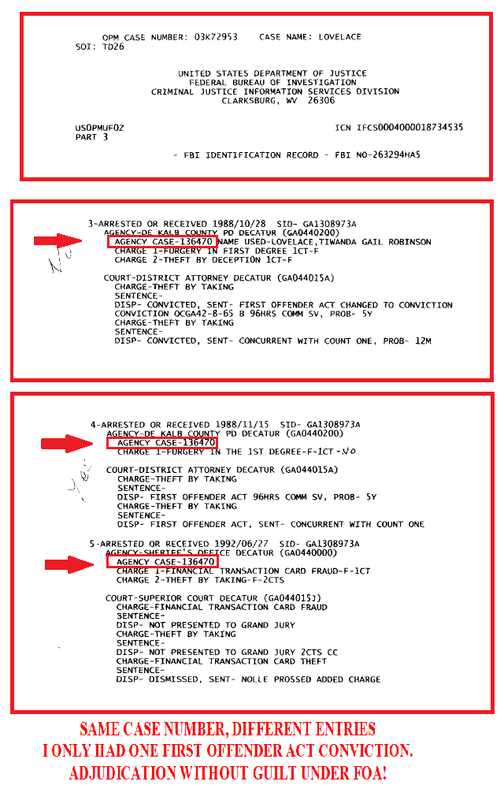 records reflect multiple arrest and repeated offenses and in fact provides misleading transmittals when 4 of the 5 items listed are in reference to the same original First Offenders Act offense. 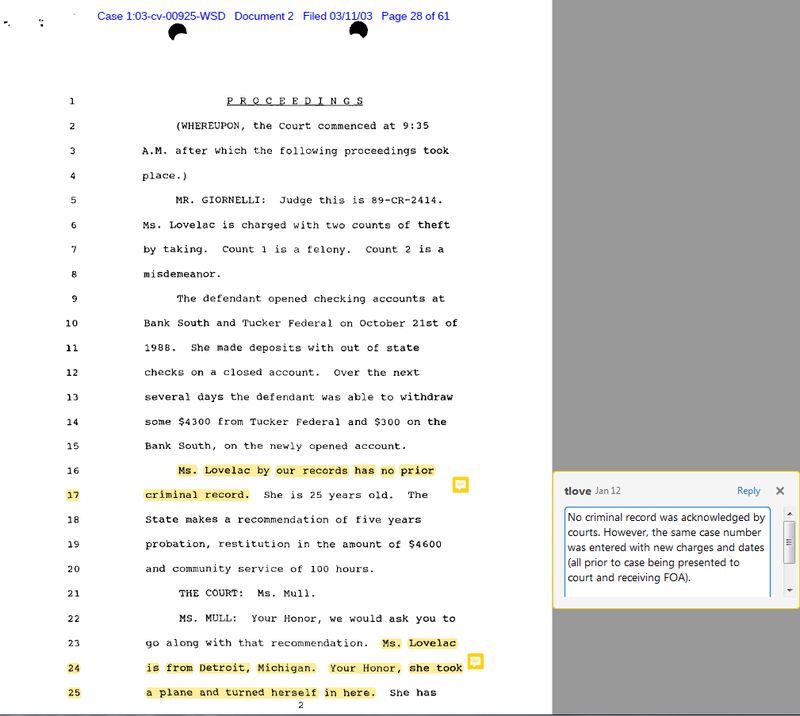 The Agency Case: 136470, is the same for 3 of the offense but put under various names. Please note that No. 5 is dated the day that I turned myself into police from original incident for which I was given the First Offender Act. Date and charges are inaccurate and/or inaccurately presented. The CJIS in comparison with actual facts shows bias and/or strong implications of bias in my quest to exercise my rights to life and liberty. I am repeatedly impeded by Defendants actions and inaction, which clearly demonstrates malice, vindictiveness, intolerance and prejudice on the part of authorities. 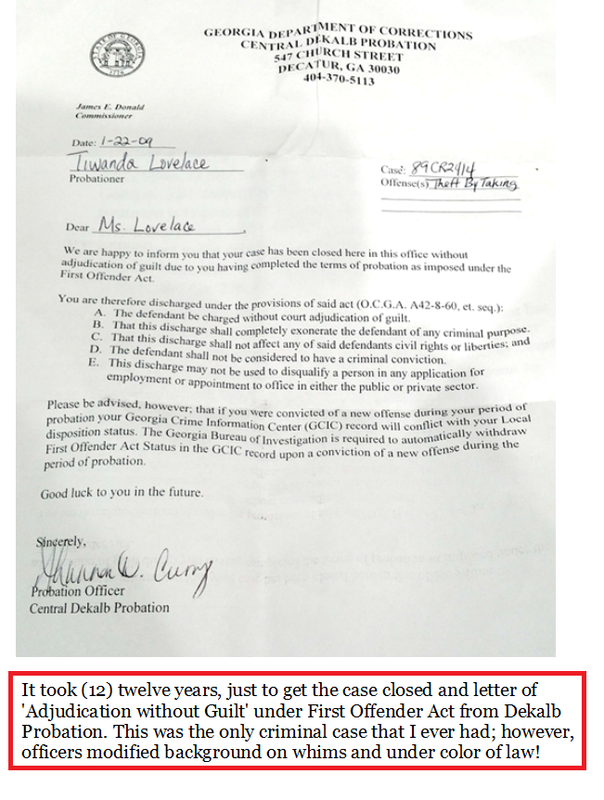 In this case, a Georgia Probation Officer, (without attempt or service of notification of hearing, etc…) presented a violation report to the courts on a probationer whom he knew was reporting in all aspects according to sentencing order. Probation officer knew was reporting in all aspects according to sentencing order. Probation officer knew that Michigan Probation Office has accepted case for supervision and that Lovelace was reporting as directed by courts. In Wisconsin v. Constantineau, 400 U.S. 433 (1971), it invalidates a statutory scheme by which a person, without any opportunity for a hearing and rebuttal, could be labeled and barred from justice; the court noted that governmental action was stigmatizing the individual’s reputation, honor and integrity; as in this case. 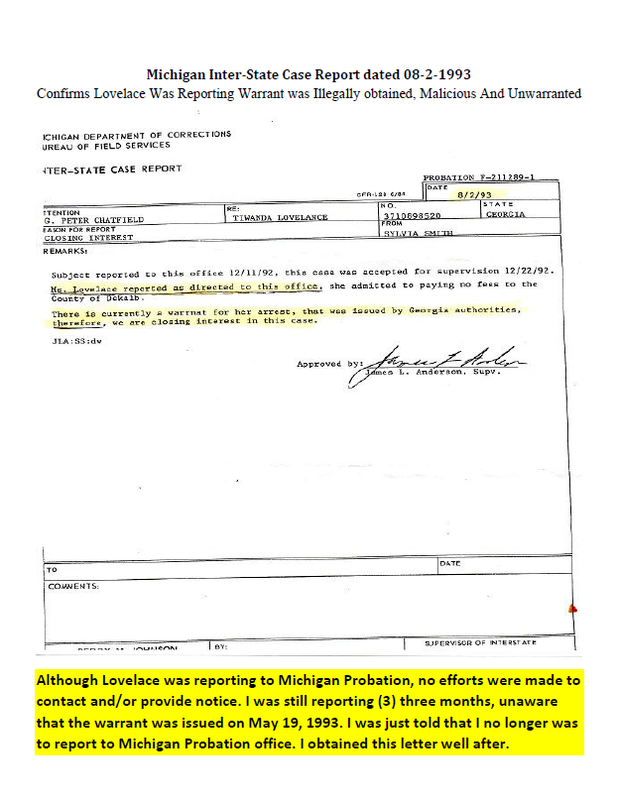 Lovelace was not avoiding service or evading supervision in that she was reporting as directed; hence, Lovelace could have been served with notice either by or through Michigan Probation office or directly since her address was on files. Each of the charges listed were for same incident. I left the state of Ga but returned 1992/06/27 to turn myself in. The police rearrested me as if I had been caught committing another crime; however, they dismissed the groundless charges, but arrest stayed. While awaiting court, police took me out of holding and re-arrested me again, but charges were dismissed. I have attached documents in support of allegations. I have a letter showing that this Case was closed without adjudication of guilt under First Offender Act O.C.G.A. a42-8-60. This letter should have generated an GCIC/ CJIS update and removal of at least 3 of the 5 Arrest or Received from original case no. Case: 136470 / 89CR2414. Every time I attempt to leave the country, I am met with scrutiny based on this background. There were no other offenses committed after First Offender Act.